As the capitalist crisis deepens the ruling class will do everything it can to make the working class pay for it. Since the economic crash in 2008 governments have launched a wholesale attack on our living standards. This takes the form of cuts to health, education and other services; removal of workers’ rights and destruction of social welfare and social housing. There is an urgent need to build a fighting anti-cuts movement, led by the most militant sections of the working class, and representing the needs of the entire class. Labour councillors across Britain have shed crocodile tears as they implement the most savage reductions in services in a generation. The movement must hold them to account if we are to get anywhere. 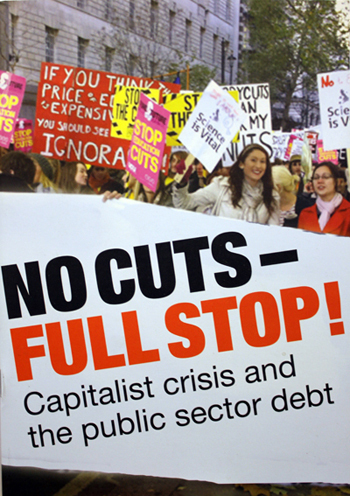 RCG branches are involved in anti-cuts work throughout the country. See our events and contacts pages to get involved! Equal pay in Glasgow: under attack, women fight back!